Some say there are three seasons in Cebu – sunny, rainy, and Sinulog. 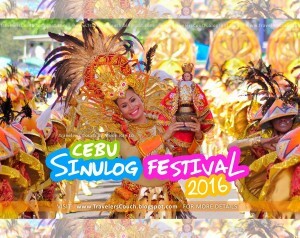 Sinulog is a festival held on the third Sunday of January every year in honor of the Santo Niño, Cebu’s patron saint. This world-famous festival is one of the biggest and grandest in the Philippines. Though the main event takes place on the weekend, it’s basically a week-long celebration comprising of religious activities and street parties. A 9-day novena mass is held at the Basilica Minore del Santo Niño. On Sunday, a grand parade takes over the streets of Cebu City with participants hailing from different parts of the country – each team offering a majestic display of colorful costumes and spectacular props. At night, the city transforms into a huge party zone.